Parade of strawberry-and-cream Underwest Donuts. Photo by Neil Wolfson. 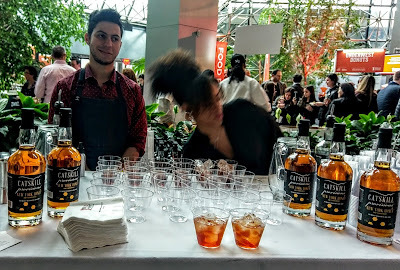 WE arrive at the 2017 edition of the NYC Taste of the Nation (TOTN) a couple of days ago, auspiciously beating the rainstorms. Immediately, we are elated to discover Walter's Hot Dogs team members serving from their truck at the entrance of the TOTN venue at 180 Maiden Lane. Its venerable art-deco pagoda in Mamaroneck has been a regular culinary destination for Westchesterites and travelers since 1919. 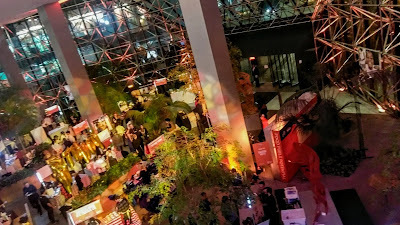 Aerial view of Taste of the Nation's colorful party for No Kid Hungry. Photo by Joel Levin. the program administered by Share Our Strength. The restaurateur, head of the Union Square Hospitality Group and the Shake Shack empire, is pleased with the turnout here and mentions that he is awaiting upcoming reviews of his newly relocated flagship Union Square Cafe. Massoni's savory caponata cannoli are cheesy and crunchy. Photo by Joel Levin. Equally kaleidoscopic are the creations of NYC's inventive corps of mixologists, working with the likes of Monkey 47 gin from Germany, New York Honey Rye Whiskey (from Catskill Provisions), Fords London Dry Gin formulated by four New York City bartenders, as well as Virgil Kaine Ginger-Infused Bourbon. New York Honey Whiskey from Catskill Provisions. Photo by Joel Levin. 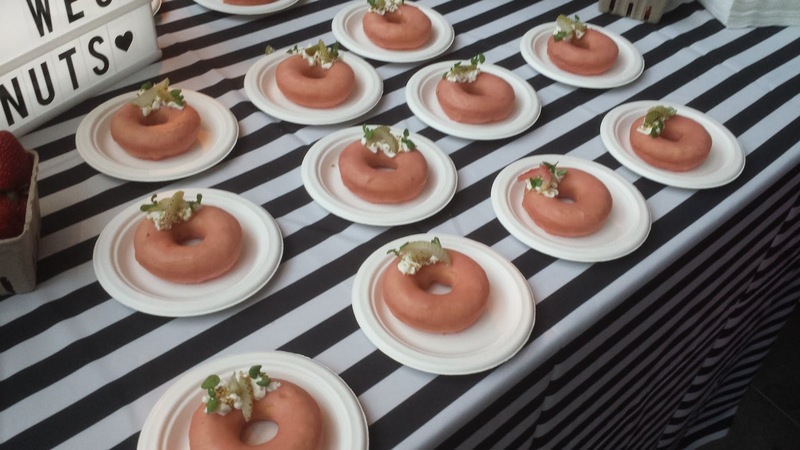 Among the many desserts are amazing strawberry-and-cream donuts from Underwest Donuts and pb&j ice cream from Oddfellows Ice Cream. No one should leave this splendid event hungry or thirsty. Upstairs, we encounter more culinary environments, including a grouping of sweets: Mexican ice pops, cotton candy, chocolate, a row of corporate hospitality cabanas. Also here is a game-equipped casino where Empire Casino's restaurant is serving buttery lobster-and-crab ravioli and prime-beef sliders. 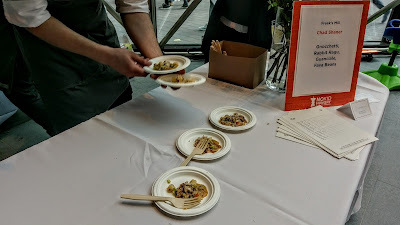 Freek's Mill's creative preparation of rabbit ragu with guanciale. Photo by Joel Levin. Since the mission of No Kid Hungry is to end childhood hunger, depending on how one views it, TOTN shows either poetic irony or poetic justice, in that it takes a bounteous feast to enable the fulfillment of basic needs for underserved youngsters. Still, last year’s TOTN raised enough dough to help feed needy children more than one million healthful meals through City Harvest, Hunger Solutions NY, Food Bank for New York City and Hunger Free America. Visit http://www.bit.ly/2nbKoxr to learn more about Taste of the Nation 2017 and https://www.nokidhungry.org/ to learn more about NO Kid Hungry.